PS: If you of your family and friends have not already please vote every day for Clara who is a "Doodle for Google" finalist. The winning artist will see his or her artwork on the Google Ireland homepage, receive a €5,000 college scholarship and a €10,000 technology grant for his or her school as well as a Chromebook for themselves and their teacher. Beidh R1 Siobhán Ní Núnáin ag glacadh páirt i gcomórtas drámaíochta sa scoil ar an gCéadaoin, an 5ú lá de mhí Márta 2014. Ta na 'props' agus na héadaí céanna a bhí acu don dráma Nollag ag teastáil uatha. An féidir libh a bheith cinnte go mbeidh siad acu ar an Luan, an 3ú lá de mhí Márta '14. Siobhán Ní Núnáin's 1st Class will be taking part in a drama competition in the school on Wednesday 5th March 2014. We have the 'props' and they will need the same costumes as they had for the Christmas play. Please be sure that they have them this Monday, 3rd March '14. Ní theastaíonn uaim go ndéanfaidh éinne dearmad ar "DOODLE FOR GOOGLE"! Leanaigí leis an vótáil do Chlara ar bhur ngléasanna ar fad! Tá ríomhphost agam gur féidir liom sheoladh chuig éinne atá sásta é a scaipeadh ina n-áit oibre. Táim ag lorg gach aon sórt áiteanna oibre agus na comhlachtaí móra ach go háirithe -Eli Lilli, Pfizer, Novartis, GSK, Johnson & Johnson, DePuy, Apple, Bord Gais, Cork Co. Council -AON áit go bhfuil go leoir daoine ag obair iontu! Cur ríomhphost chuig na scoile ag rá go bhfuil tú sásta iad a scaipeadh agus seolfaidh mé chugat é.
I don't want people to forget about our DOODLE FOR GOOGLE campaign! Please keep voting for Clara on ALL your devices! I have an email to raise awareness prepared that I can forward to anybody who is happy to distribute at their workplaces. I'm looking for all sorts of workplaces and employers -Eli Lilli, Pfizer, Novartis, GSK, Johnson & Johnson, DePuy, Apple, Bord Gais, Cork Co. Council -ANY workplaces where people work at computers where it'd only take a second for them to vote online. Please email the school if you're happy to circulate an email to your colleagues and I'll send you the link. Thosaíomar ar thraenáil dár Lá Mór sa chathair ar an 7ú Márta 2014. Fé mar is eol daoibh táimid ag glacadh páirt i "Rith 2014" agus beimid go léir ag rith km amháin anuas Sráid Phádraig an lá san. As seo go dtí an lá mór beimid ag traenáil gach maidin ag rith ón scoil go bun an chnoic agus thar nais! Tá sé i gceist againn seo a dhéanamh gach lá más féidir idir seo agus an lá mór mar sin tá cead ag na páisti an eide spóirt a chaitheamh gach lá idir seo agus sin. Beidh áthas an domhain orthu sin a chlos táim cinnte! Beidh orthu an éide spóirt scoile a chaitheamh ar an lá féin mar sin táim ag súil go mbeidh cruth deas orthu don lá. Chun seans a thabhairt daoibh an éide spóirt a ní is a ullmhú beidh cead ag na páistí éadaí spóirt eile a chaitheamh ar scoil ar an Déardaoin an 6ú Márta 2014. Fuair gach páiste bronntanas inniú do chóta ardfheicithe ba chóir dóibh na cótaí seo a chaitheamh ag teacht ar scoil go dtí an 7ú Márta. Táimid ag súil go mór le páirt a ghlacadh san ócáid mór seo!!! Maith sibh a pháistí iontacha! We started the whole school training this morning for our big day in the city on the 7th March 2014! As you all know we are participating in "Rith 2014" and we will be running 1 km down Patrick Street on that day. From now until then the whole school will do a training session in the morning by doing a warm-up, running as far as the Bandon Road and back and then some stretches etc after. We hope to do this every morning until 7th of March therefore the children may wear their sports uniforms every day until then. I'm sure they'll be delighted to hear that! On the day itself they will need to wear their Gaelscoil Chionn tSáile sports uniform so please ensure it is clean and well presented. On Thursday 6th March 2014, in order to facilitate you washing their sports clothes the children may wear their ordinary sports clothes to school. Each child was given an RSA hi-viz jacket today. They should bring these to school every day until and including 7th March 2014. We're all really excited about taking part in this big occassion! Gaelscoil Chionn tSáile abúúúúú! Beidh blitz camógaíochta ar siúl ar an Aoine, an 28ú lá de mhí Feabhra 2014 in Ath an Mhaide. Beimid ag fágaint an scoil ag a 12.00 a chlog. Tá síobanna eagraithe againn dóibh chun dul ann ach beidh oraibh iad a bhailiú thart ar a 3.30pm in Ath an Mhaide. There will be a hurling blitz on Friday 28th February 2014 at Riverstick. We will be leaving the school at 12.00. We have organised lifts for them but you will have to collect them around 3.30 pm at Riverstick. Ar mhiste libh na cácaí a fhágaint ag an scoil nó ag an Temperance Hall maidin Dé hAoine 28.02.2014 agus freastal ar an Díolachán Cácaí sa Temperance Hall idir 10.30 agus 12.30. 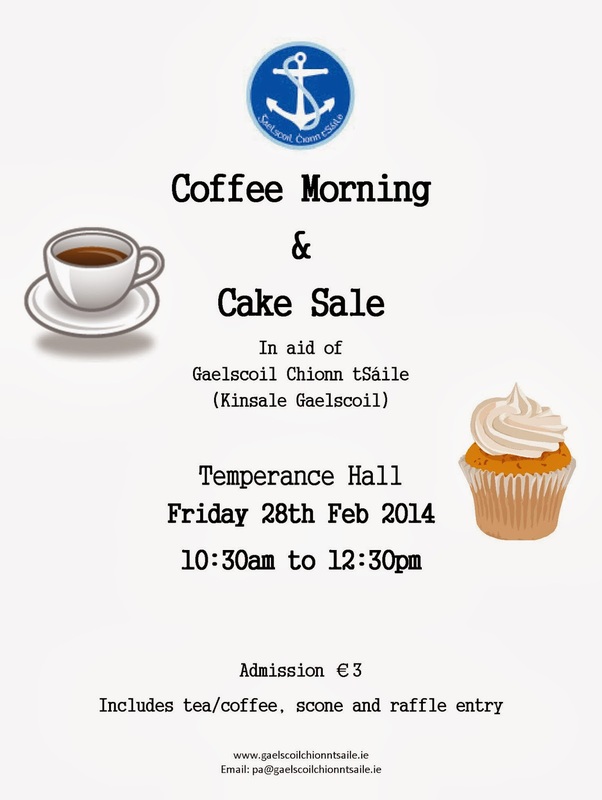 Please could you drop off cakes to either the school or the Temperance Hall this Friday morning 28.02.2014 and attend the cake sale at the Temperance Hall between 10.30 and 12.30 a.m.
A chairde! Meabhrúchán faoin oíche eolais do thuismitheoirí ar bhullaíocht ar líne anocht, 26/02/'14, sa scoil ag 6.30 i.n. B'fhiú go mór daoibh freastal air mar is gá daoibh a bheith eolach faoin mhodh bullaíochta nua seo. Tá na múinteoirí ag freastal ar chúrsa atá dírithe ar mhúinteoirí. Dear Parents! Just to remind you all about the information night for parents on cyberbullying tonight, 26/02/'14, at 6.30pm in the school. It's well worth your while attending as we all need to be more informed on this. The teachers are attending an anti-cyberbullying course aimed at teachers. Forewarned is forearmed. Fé mar is eol daoibh, tá bosca caillte & faighte san oifig ag Hilde. Tá sé lán do éadach cótaí, éide scoile, hataí srl. san aireamh. Níl ainm ar aon phíosa éadaigh. Beidh an bhosca seo á thabhairt go dtí an siopa dara láimhe seachtain ó inniu, Dé Máirt, an 4ú lá de mhí Mhárta 2014. Mar sin, má tá éadaí in easnamh oraibh téir agus cuardaigh an bhosca agus, le bhur dtola, cur ainm do pháiste ar gach uile chuid dá néide scoile. As you know, Hilda has a 'lost and found' box in the office. It is full of clothes - coats, uniforms, hats etc. There isn't a name on any item of clothing. This box will be brought to the second hand shop in a week from now, on Tuesday 4th March '14. So if you are missing clothes, go and search in the box and please put your child's name on every piece of their school uniform. Meabhrúcháin tapaidh faoi leanuint leis an vótáil do Doodle Clara! Téir go http://www.google.ie/doodle4google/vote.html#d=d2-10 chun vótáil GACH LÁ le bhur dtola. Ma eiríonn le Clara seo a bhuachaint gheobhaidh an scoil deontas €10,000 le caitheamh ar theicneolaíocht! Chomh maith leis sin tá fhios agam go bhfuil tuismitheoirí againn sa scoil atá go hiontach chun rudaí a cur i mbéal an phobail mar sin tugaim cuireadh daoibh uile teacht chun na scoile tráthnóna Dé Luan an 24/02/'14 ag 8.30i.n. chun feachtas poblaíochta a chur le chéile ar son Clara. Braitheann seo ar an méid vótaí a fhaigheann sí mar sin tá an seans céanna aici is atá ag gach éinne eile sa chomórtas más féidir linn daoine a spreagadh chun vótáil! Tá súil agam go mbeidh sibh in ann a bheith ann! A quick reminder to keep voting for Clara! We really need you all to log onto http://www.google.ie/doodle4google/vote.html#d=d2-10 to vote for Clara's doodle EVERY DAY! There's an overall prize of €10,000 for the school to spend on technology! Think of all the fundraising that has to be done to raise that kind of money! We really need to push forward with this and I know there are parents in the school with and without backgrounds in marketing who would be absolutely fantastic at organising a "vote for Clara" campaign so I'm inviting you all to come to the school Monday evening 24/02/'14 at 8.30pm to get this show on the road! Whether we like it or not, this whole competition is based on the number of votes received therefore we are in with as much of a chance as every other competitor if we can only encourage people to vote! I urge as many people as possible to come and contribute their ideas! Reminder: Please vote for Clara! If you have not already please vote for Clara who is a "Doodle for Google" finalist. The winning artist will see his or her artwork on the Google Ireland homepage, receive a €5,000 college scholarship and a €10,000 technology grant for his or her school as well as a Chromebook for themselves and their teacher. Tá breis eolas faighte againn faoin gcomórtas "Doodle for Google". D'éirigh le ceann amháin acu dul ar aghaidh go dtí an chraobh ceannais na hÉireann! Dá bhrí sin is gá dúinn a bheith an-gníomhach agus feachtas mór vótála a cur i mbun! Tosnóidh an comórtas vótála ar an Luan an 17ú Feabhra 2014. Téir go dtí chun an doodle a fheiscint http://www.google.ie/doodle4google/vote.html#d=d2-10 Scaip an scéal le bhur gclanna agus gcairde le bhur dtola. Is gá dúinn feachtas abhal-mhór a cur i bhfeidhm má tá seans ar bith le bheith againn an comórtas / duais mór a bhuachaint. Táim lán-oscailte le smaointe uaibh, a thuistí, mar sin cur ríomhphost chugainn má tá aon smaointe maithe agaibh! Is doodle le Clara Ní Chathail ó Rang 2 a chuaigh ar aghaidh an t-am seo. Bail ó Dhia uirthi. Ba mhaith liom chomhghairdeas mór a rá le Philippa Nic an Taoisigh chomh maith áfach as ucht an t-éacht mór a rinne sí sa chomórtas chomh maith. Gaelscoil ealaíonta Chionn tSáile abú! We have received more news about the "Doodle for Google" competition. One of the children has succeeded in progressing to the All Ireland Final! Therefore we need to be very busy and start a big voting campaign! The voting competition will start on Monday the 17th February 2014. Go to http://www.google.ie/doodle4google/vote.html#d=d2-10 to see and vote for the doodle. Please spread the news to all your families and friends. We have to set up a huge campaign to have any sort of chance in winning the competition / prize. I am completely open to suggestions to raise awareness from you, parents, so send in emails to us if you have good ideas! 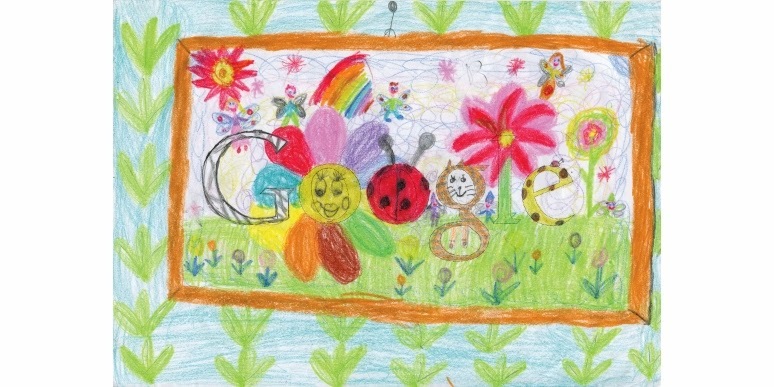 It was Clara Ní Chathail's (2nd Class) doodle that made it through to the next round this time. Bless her talents! However, I would also like to say a big congratulations to Philippa Nic an Taoisigh, for her huge success in the competition as well. Artistic Gaelscoil Chionn tSáile abú! Tá an scoil dúnta go dtí Dé Luan an 24 Feabhra 2014 @ 08.50. Bainígí taitneamh as na laethanta saoire! The school will be closed for mid term until Monday the 24th February 2014 at 08.50. I wish you all a lovely break! PS: Apologies for the mistake in yesterday's post! The school will be close for mid term until Monday the 24th February 2014 at 08.50. I wish you all a lovely break! Beidh blitz camógaíocht R3 ar siúl ar an 25ú lá de mhí Feabhra 2014 in Ath an Mhaide. Níl na h-amanta socraithe fós ach beidh siad againn ar an Luain, an 24ú lá de mhí Feabhra 2014 daoibh. Eagróimís síobanna dóibh. Beidh blitz camógaíochta R4 ar siúl in Ath an Mhaide ar an 28ú lá de mhí Feabhra 2014 óna 12.30 p.m. go dtí 3.30 p.m. um thráthnóna. Beidh síobanna eagraithe againn dóibh. There will be a blitz for 3rd Class on the 25th February 2014 in Riverstick. The times aren't fixed for them yet but will be on Monday 24th February '14. We will organise lifts for them. The 4th Class blitz will be in Riverstick on the 28th February 2014 from 12.30 p.m. to 3.30 p.m. We will have lifts organised for them. Tá Aifreann "Déanaigí é seo i gcuimhne ormsa" ar siúl amárach, an 15ú Feabhra 2014 @ 6.30 p.m. The "Do this in Memory Mass" is tomorrow, 15th February 2014 @ 6.30 p.m.
Tá an-deascéal againn! D'éirigh le beirt d'ár bpáistí tréitheacha gabháil tríd go dtí an chéad babhta eile sa chomórtas Doodle for Google. Clara Ní Chathail ó Rang 2 agus Philippa Nic an Taoisigh ó Naí Mhóra atá i gceist. Ba rud iontach é dá n-eireodh le páiste amháin a bheith sa chomórtas ach tá sé do-chreidte gur éirigh le beirt acu dul ar aghaidh as na mílte iontráil! Má éiríonn leo bheith sa chéad comórtas eile beidh feachtas votála ar líne ar siúl agus beidh orainn a bheith an-gníomhach ar fad leis! Cuirfear scéala chugainn go luath! Maith sibh arís Clara agus Philippa! We have very good news! 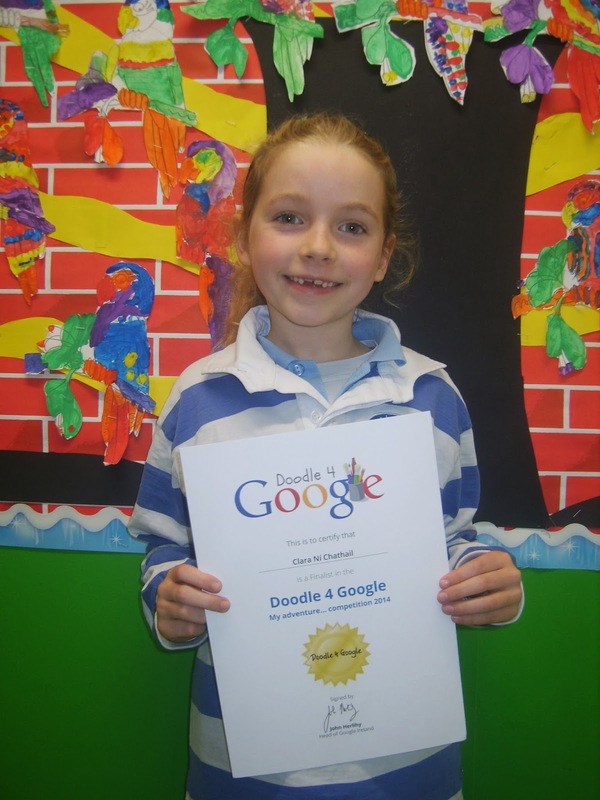 Two of our talented children have succeeded in going through to the next round in the Doodle for Google competition. They are Clara Ní Chathail from 2nd class and Philippa Nic an Taoisigh from Senior Infants. It would be an amazing event for one child to be in the competition but it is incredible that the two of them succeeded in advancing to the next stage out of the thousands of contestants! If they succeed in the next stage there will be an on-line vote so we will have to be very busy if it comes to that.They will let us know shortly. Well done again Clara and Philippa! Táimíd ag súil go mór leis na Sacraimintí agus táimíd ag obair go dian. Beidh na freagraí Gaeilge don Aifreann ar eolas acu chomh maith. Déanfaimíd cleachtadh ar na bhfreagraí Béarla uair amháin ar scoil ach is é do fhreagracht sa bhaile atá ann chun a chinntiú go bhfuil siad de ghlan mheabhair ag do leanbh as Béarla. Níl an t-am againn iad a dhéanamh sa dá theanga ar scoil. Úsáid lch 30-39 sa THUMB mar chabhair. Tá fáilte roimh na leanaí na paidreacha béarla atá foghlamtha sa bhaile a rá ós ord leis an rang nuair atá siad de ghlan mheabhair acu, ba bhreá liom leanbh a chloisint ag rá an Chré Nicea-Constaintínópail de ghlan mheabhair! Tá na cóipeanna béarla seolta abhaile agam inniu. Preparation for the Sacraments is well underway and we are looking forward to them. They will also learn the Irish responses off by heart for their First Holy Communion. I will practice the English responses with them once in school, but it is up to you to practice them regularly with them at home to prepare them for their weekly participation in mass. We just don't have time to cover the English and Irish in school. Please refer to THUMB pages 30-39 for English Missal. I would be delighted to listen to any student at school who is eager to recite a prayer they have learnt in English at home and will allow them to share it with the class. I would be especially impressed if anyone manages to learn the Nicene Creed off by heart! I have sent home copies of all the prayers in English today, along with a copy of the Irish Missal, for your own reference. Fé mar is eol daoibh beidh Céad Comaoineach na bliana seo ar siúl ar an Sathairn an 24ú Bealtaine 2014. Rinne an Bord Bainistíochta cinne 3 bliana ó shin go gcaitheadh na buachaillí an éide scoile le bléasar scoile agus go mbeadh rogha ag na cailíní éide scoile nó gúna Comaoineach a caitheamh. Tá tuismitheoirí na mbuachaillí ag iarraidh éadaí na mbuachaillí a shocrú agus táim ag ceapadh go gcaithfidh go bhfuil na bléasair a caitheann na buachaillí ag roinnt teaglaigh sa bhaile agaibh. B'fhiú ceist a cur ar na tuistí an mbeadh suim acu iad a dhíol nó athchursáil a dhéanamh orthu. Muna bhfuil siad ar fáil nó má tá fonn oraibh bhur gcinn féin nua a fháil is féidir iad a fháil i Marks and Spencer ar tuairim is €25.00. Is féidir libh iad a thabhairt go 4orm i gCarraig Uí Leighin chun an suathantas a fháilt air ar €5.00. Nó is féidir suathantas a cheannach ó Hilda san oifig. Tá roinnt aici ach níl mórán. Rinneamar iarracht bléasúr scoile a fháilt ó 4orm ach bhíodar a bhfad ró-dhaor. Aon rud atá ar siúl againn is ea an slí is eacnamaí. As you know this year's First Holy Communion is on Saturday the 24th May 2014. The Board of Management decided three years ago that the boys should wear their school uniform with a blazer and that the girls could wear either their uniform or the traditional Communion dress. The parents of the boys are trying to organise the boys blazers and I am thinking that there have to be some at home in your households. It would be worth asking the parents if they were interested in selling or recycling them. If they are not available or if you wish to buy your own new ones, they can be bought at Marks and Spencer at approx. €25. You can give them to 4orm in Carrigaline to put crests on them for €5.00. Or you can buy a crest from Hilda in the office. She has some but not many. We tried to get a school blazer from 4orm but they were far too expensive. We do everything in the most economical way possible. The next Do This in Memory Mass will take place on Saturday, 15th February 2014 at the 6.30 p.m. Mass, in St. John the Baptist Church. The following suggestions may help you to prepare your child for the Mass. This week the Mass leaflet will be sent home from school with your child and you might like to go through the order of the ceremony together. Mass becomes more meaningful and relevant for the child when they can participate in the ceremony and answer the responses and say the prayers. You might like to focus on the responses after the Introductory Rites, before and after the Gospel and after the prayers of the faithful. Please remind your child to bring the leaflet with them to Mass. The theme of this Mass will be forgiveness & peace. This is particularly appropriate for the children who are preparing to receive the sacrament of Forgiveness, their First Confession, on March 10th 2014 @ 7pm. You might like to talk with your child about the value of forgiveness and the different ways in which you are challenged to forgive yourself and others. Your child may like to know the different ways you show forgiveness and to know that God is full of forgiveness and compassion for all of us. Over the next few days in school, the children will learn about forgiveness and the meaning of the word Shalom, that is, being at peace and at ease within ourselves and with others. Please arrive at least 10 minutes before the start of mass and take your place towards the front of the Church. We would ask each child to sit with their family until the Priest invites them to stand at the alter for the Gospel. The children will return to sit quietly with their family after the homily. At the end of mass please remind your child to collect their copy of the Grapevine at the alter. Táimid ag dul tríd cúntaisí na scoile faoi láithir. Tá go leoir airgead le teacht isteach fós ag tuismitheoirí. Seans go bhfuil dearmad déanta ag daoine futhu. Ní maith liom brú a chur ar dhaoine ach tá an scoil féin faoi bhrú ó thaobh airgid de. Muna bhfuil tú cinnte faoi bheith i bhfiacha leis an scoil cur glaoch ar Hilda. Oibríonn Hilda gach lá go dtí 1.30p.m. Beidh sí in ann a rá leat. Seachas sin beidh billí ag dul abhaile go luath. Tá méideanna éagsúla iontu ó €2 - thart ar €200. Tá sé in am iad a shocrú. Má tá deachrachtaí ag daoine ní bheidh aon fhadhb le córas íocaíochta míosúla a thosnú go deireadh na bliana. Níl le déanamh ach labhairt le Hilda. Beidh na socraithe seo faoi rún an scoil agus na daoine aonair. We are going over the school accounts at the moment. There is a lot of money due from parents. It is possible that people have forgotten. I don't like to put pressure on people but the school itself is under financial pressure. If you are not sure about owing money to the school, give Hilda a ring. Hilda works every day until 1.30 p.m. She will be able to tell you. Outside of that, the bills will be going home shortly. There are various amounts owing from €2 to over €200. It is time to settle them. If people have difficulties there will be no problem setting up a monthly payment plan to the end of the year. All you have to do is to speak to Hilda. These arrangements will be confidential between the school and the individuals involved. Tá traenáil ar siúl ar an Domhnach seo, an 9ú la de mhí Feabhra 2014 idir 1-2 a chlog. Beidh sé ar siúl i Halla Naomh Multose agus beidh roinnt tuismitheoirí i gceannas air. Mholtar éinne i Rang a 2,3,4 ina bhfuil suim acu san iománaíocht iarracht mór a dhéanamh chun a bheith ann. There is training organised for this Sunday, 9/02/2014 between 1 and 2 o'clock. It will be held at St. Multose Hall and there will be some parents in charge. I encourage anyone in 2nd, 3rd and 4th class who is interested in hurling to make a big effort to go. Tá dea-scéal agam daoibh! Táimid tar éis cur isteach ar "Rith 2014". Is éard atá i gceist ann ná féile náisiúnta a bheidh ar siúl do Sheachtain na Gaeilge, 07-15 Márta 2014. Ta cúrsa 1000 Km leagtha amach chun ollrith sealaíochta gan stad a dhéanamh ó Bhaile Bhuirne i gCo. Chorcaí go Béal Feiriste thar 9 lá leis na mílte duine ag glacadh páirte ann. Is slí úrnua é Rith 2014 chun teanga agus cultúr na Gaeilge a cheiliúradh go feiceálach i bpobail ar fud na hÉireann. D'éirigh linn km iontach i gcroílár na chathrach a fháil - 1km ar Shráid Phádraig! Beidh na bóithre dúnta don bhféile agus teastaíonn uaim go mbeidh an scoil ar fad páirteach ann ó Naíonáin Shóisearacha go dtí Rang 5. Beidh sé ar siúl againn ar an 7ú Márta '14 ag timpeall 1 a chlog. Beidh na páistí ag fáilt busanna ón scoil agus thar nais ina dhiaidh. Beidh fáilte roimh lucht féachanna. Táimid ag lorg lucht féachanna chun tacaíocht a thabhairt dúinn! Cuirfidh sé go mór le seachtain na Gaeilge. Cuirfidh sé chomh maith le haclaíocht agus gníomhaíocht na bpáistí. Táimid chun tús a cur leis an dtraenáil láithreach! Tá súil agam go mbeidh gach éinne in ann a bheith ann! Gan amhras munar féidir, tá sé go breá ach scéal a cur chugainn roimh ré. Cuirfear tuillradh eolas chugaibh go luath. I have good news for you! We have entered "Rith (Run) 2014". It is a national festival that will be held for Seachtain na Gaeilge (Irish Week), 07 - 15 March 2014. There will be a 9-day, 1000 Km relay marathon from Ballyvourney in Co. Cork to Belfast with thousands of people taking part. Rith 2014 is a new initiative to celebrate the Irish language and culture in a very visible way to people all around Ireland. We succeeded in getting a great kilometer in the very centre of the city - 1km on Patrick Street! The roads will be closed for the festival and I want the whole school to take part, from Junior Infants to 5th Class. It will be on the 7th March '14 at around 1 o'clock for us. The children will be taking buses from school there and back. Supporters are welcome. We are looking for supporters to cheer us on! It will hugely add to Seachtain na Gaeilge. (Irish Week). It will also increase the childrens' fitness and activity. We are going to start training immediately! I hope everyone will be able to be there! Of course, if you can't that is fine but please let us know beforehand if your child cannot participate. 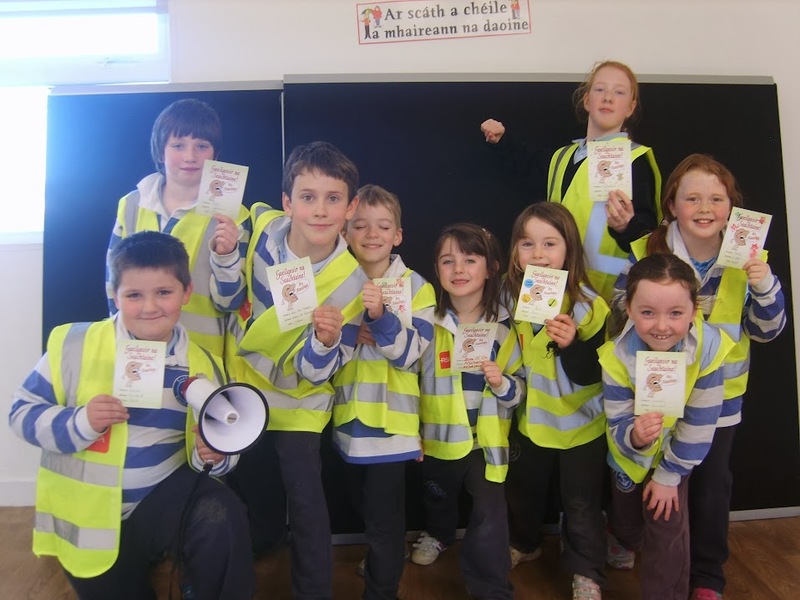 Foireann na Scoile Rang 4 (Seán Ó Cochláin, Daithí Ó Nualláin, James Ó Murchú agus Darragh Ó Bruadair) agus Rang 5 (Amelia Colbard, Diarmuid Ó Cochláin, Conchúr Ó hEathairn agus Fionn Ó Briain) a ghlac páirt i dTráth na gCeist An Comhair Creidmheasa. D'éirigh go hiontach leo. Bhuaidh Rang 5 agus beidh siad ag dul ar aghaidh ar son Cionn tSáile sa chéad babhta eile. Tháinig Rang 4 sa tríú háit. Maith sibh Rang 4 agus Rang 5. Míle buíochas fo mór-mhór do Múinteoir Eavan agus Múinteoir Siobhán Ní Bhruacháin. Under 11 team - Rang 4 (Seán Ó Cochláin, Daithí Ó Nualláin, James Ó Murchú agus Darragh Ó Bruadair) came third in their group. Under 13 team - Rang 5 (Amelia Colbard, Diarmuid Ó Cochláin, Conchúr Ó hEathairn agus Fionn Ó Briain) won and will now represent Kinsale in the Cork heat. Well done to all who represented Gaelscoil Chionn tSáile impeccably last night. Thanks especially to Múinteoir Eavan and Múinteoir Siobhán Ní Bhruacháin. Beidh an cór ag glacadh páirt i bhFeis Maitiú i Halla Feis Maitiú sa chathair maidin an Déardaoin seo an 06/02/2014. Beidh an bus ag fágaint na scoile ag 9.00r.n. ar an toirt. Beidh an comórtas ar siúl 10.00 - 12.00. Beidh ar na páistí lón a thógaint leo. The school choir will be participating in Feis Maitiú in the Feis Maitiú Hall this Thursday, 06/02/2014. The bus will be leaving the school at 9.00 a.m. sharp. The competition will be held from 10a.m. - 12 a.m. approx. The children will have to bring lunch with them. Tá seanmháthair le Siobhán Ní Núnáin tar éis bás a fháil. Táimid go léir ag cuineamh ar Shiobhán agus ar a chlann ag an tam deacair seo. Siobhán Ní Núnáin's grandmother has passed away. We are all thinking of Siobhán and her family at this difficult time. Rang 2 - Dáta gCéad Fhaoistin / 2nd Class - Date for First Confession. Beidh an Chéad Fhaoistin ar siúl i Séipéal an Pharóiste ag a 7 a chlog ar an Luan an 10ú Mhárta 2014. The First Confession will take place in the Parish Church at 7 p.m. on Monday, March 10th 2014. Dé Chéadaoin, an 5ú de mhí Feabhra 2014: Beidh buachaillí Rang a 3 ag traenáil i Halla Naomh Multós. Beidh siad ann óna 9-10 ar maidin. Tá síobanna eagraithe againn dóibh. Tabhair ar scoil mar is gnáth iad. Dé Luain, 10ú de mhí Feabhra 2014: Beidh blitz na buachaillí in Ath an Mhaide óna 1-4 a chlog um thráthnóna.Beidh síobanna á eagrú ag Múinteoir Ciara agus Eithne go dtí an comórtas agus beidh Múinteoir Ciara i dteagmháil le tuismitheoirí na bpáistí a bheidh thar n-ais tar éis am scoile. Dé Céadaoin 12ú de mhí Feabhra 2014: Traenáil cailíní R3 i Halla Naomh Multós. Beidh siad ann óna 9-10 ar maidin. Tá síobanna eagraithe againn dóibh. Tabhair ar scoil mar is gnáth iad. Wednesday, 5th February 2014: 3rd Class boys will be training in St. Multose Hall.They will be there from 9 - 10 a.m. We have lifts organised for them. Bring them to school as per usual. Monday, 10th February, 2014:The boys blitz in Riverstick will be from 1-4 p.m.
Múinteoir Ciara and Eithe will be organising lifts to the competition and Múinteoir Ciara will be in contact with parents of the children that will be back after school hours. Wednesday, 12th February 2014: 3rd Class girls training in St. Multose Hall. They will be there from 9 - 10 a.m. We have lifts organised for them. Take them to school as per normal. Dé Céadaoin, 5ú Feabhra 2014: Traenáil cailíní R4 i Halla Naomh Multós, 9-10 ar maidin. Dé hAoine 7ú Feabhra 2014: Blitz do chailíní R4 in Ath an Mhaide 1-4 a chlog um thráthnóna. Beidh síobanna á eagrú ag Múinteoir Ciara agus Eithne go dtí na cluichí agus beidh Múinteoir Ciara i dteagmháil le tuismitheoirí na bpáistí a bheidh thar n-ais tar éis am scoile. Wednesday, 5th February 2014: 4th class girls training at St. Mustose Hall, 9-10 a.m.
Friday 7th February 2014: 4th Class girls blitz in Riverstick, 1 - 4 p.m.
Múinteoir Ciara and Eithne will be organising lifts to the matches and Múinteoir Ciara will be in contact with the parents of the children that will be back after school hours.